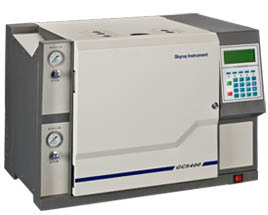 The intelligent Gas Chromatograph GC-5400 presented by Skyray Instrument Inc. incorporates advanced modern manufacturing technologies with years of experience in research and development. It is manufactured under a quality system conforming to international standards. The multi functional, easy-to-use and remotely controllable gas chromatograph provides superior performance for all applications. With adoption of advanced control technology, the microcomputer temperature control system is highly precise (less than ±0.05℃), reliable and anti-interfering. The system is divided into 5 independent heated zones with maximum temperature up to 400℃. Settable ultimate temperature and overheat protection mechanism ensure a safe operation of the instrument. Control and operating parameters can be set on the logical and easy-to-use keypad interface (including detector operating parameters). It has functions of self diagnosis, power-off protection, 10 method files saving and invoking, 2 controls of external events, timing start/stop of temperature control, time programming, detector selection, setting and display of range, polarity and current. The set value, actual value, retention and analysis time of each heated zone can be fully displayed. The large column compartment allows for simultaneous accommodation of capillary column and double packed columns. It is equipped with automated back door mechanism, a rapid heating/cooling device (lowering temperature from 350℃ to 50℃ in 7 minutes), to realize quasi room temperature control. It supports 5 compartment ramps with 6 plateaus. The carrier gas pneumatics is designed with constant pressure valve plus constant flow valve for dual stability. Constant pressure valve plus needle valve are used in the air and Hydrogen pneumatics for stable gas regulation. Both valves are in form of digital knobs, which delivers high precision, outstanding repeatability, good reliability and intuitive flow rate adjustment. Up to three kinds of detectors, Flame Ionization Detector (FID), Thermo Conductivity Detector (TCD) and Electron Capture Detector (ECD), are provided for GC-5400. Different combinations of detectors, in series or parallel operation, can meet different application requirements. The novel FID has lower limit of detection, with ejector nozzle and ions collector easily disassembled or cleaned. The fixed and accurate installation structure of the ejector ensures every instrument has consistent performance. The high sensitive TCD adopts the high resistant rhenium-tungsten wire, with twofold electronic amplification circuit optional, resulting in maximum sensitivity up to 5000mV·mL/mg. Its unique air insulation structure brings TCD higher stability of performance. Sensitivity and current selections of pulse modulation ECD constant current source are computerized. GC-5400 gas chromatograph plays a critical role in quality control of chemistry, medicine and food industries, and also applicable to quarantine, environment protection, quality supervision, oil, petrochemical industry, forensic analysis, agriculture and commodity inspection.